Forum Index > Off-topic Talk > Which mythical sword would you want to own? Posted: Wed 28 Jan, 2009 12:53 am Post subject: Which mythical sword would you want to own? One to get you thinking a bit. We all have our favourite historical swords, but what about mythical and legendary swords? An obvious example is Excalibur, "the greatest sword there never was", but then how would you interpret it? As a 5th-6th century Spatha/Saxon hybrid, a high medieval sword from Malory, a high fantasy piece, or something else? What other famous swords of myth and legend would you want to own, and why? And not just European myth and legend, there are lots of other cultures to draw from. "What doesnt Kill you makes you stronger"
Or Goliath's sword mentioned in the Bible as being used by David to take his head off, then later retrieved by him and used in war. Gram (Balmung), the mythical sword of Sigfrid. One of the chainswords of the Space Marines (better if the version for normal persons). I'm a one-handed swords person. I think the only reasonable answer to this question is a lightsaber. Perfect for brush clearing, chopping open bank vaults, or making toast at the same time as slicing bread. The Black Sword is the Champion's sword. The Word of the Sword is the Champion's Law. The Blade of the Sword is the Blood of the Sun. The Hilt of the Sword and the Hand are One. The Runes on the Sword are the Worms that are Wise. That or the Sword of Omens, 'cause it gives you sigh-beyond-sight. or Link's master sword, 'cause Zelda RULES!!! And he mome raths outgrabe. The vorpal blade went snicker - snack! ...The Vorpal sword is my candidate. No one can tell what it really is or what it looks like, yet it is an icon of utter and absolute swordishness. A blade to cut asunder the darkness beyond understanding, and help bring home reason to a disturbed world. Isn't it theorized that Jaberwocky is based on the tale of the Conyers dragon slaying? If so, then perhaps the vorpal sword should look like the Conyers falchion, which while it is certainly not the sword used by the original Conyers, is the one associated with the tale and perhaps thus the one pictured by Carroll? The Flaming Sword used by the angel to guard the Tree of Life in the Book of Genesis after Adam and Eve were thrown out of the Garden of Eden. No better subject on which to geek out! This sword here at my side don't act the way it should.."
Tolkien's Anglachel/Gurthang is right up there, too: "There is malice in this sword..." Alan Lee's cover painting to Children of Hurin depicts Gurthang as a type XI, all sinister black. I'm not sure I would have imagined a Middle Earth sword fitting that typology so neatly, but it does look cool. But, if I were to design a historically plausible replica of a specific mythical sword, I'm in Mr. Hagstrom's camp, for sure. A migration-era spath, maybe 5- 10 % oversized, intricate carvings but probably not much in the way of precious stones. 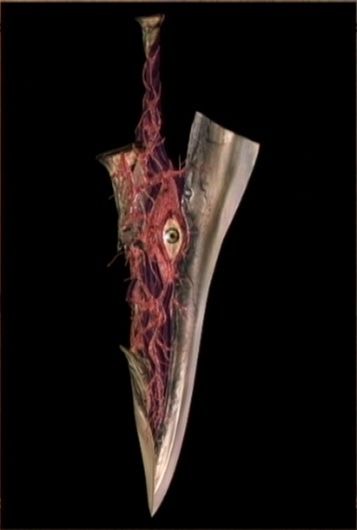 Imagine how cool "TYRFING" would look as an inlay, on a pattern-welded blade (means "war-fang" for extra whale-road cred.) I'd probably go so far as to age the thing, for that "fresh from the dig" look, too. Geez, I gotta make more money. I thought Peter's vorpal blade for the Masters of Fire exhibition was pretty damn good. So does anyone else who's seen it. My personal sword of choice is hands down Anduril. I like Ringil, Sword of Fingolfin, High King of the Noldor. I must join with others here and consign myself to the Moorcock camp. If I had to take up a fantasy sword , it would be one of the inferations of the Blacksword. I have always been partial to swords from the Silmarillion though, Ringil, Narsil, Gurthang. I was beat to the punch on Elric of Melnibone's sword, Strombringer. I guess I'd take whatever sword Conan uses though - he seems to be able to cut men in mail or plate from the shoulder to the breastbone. I'm patial to the Silmarillion sowrds as well, though it seems tough to really compare how effective they are. Gurthang seems pretty good, cut right through Glaurang's armour, though the sword has a nasty personality that bothers me a bit.